•Visit to the High Dam.Abu Simbel •Visit to Temple of Abu Simbel. Kom Ombo •Visit to Temple of Kom Ombo. Edfu •Visit to Temple of Edfu. Luxor •Visit to Temple of Luxor. •Visit to Valley of the Kings. •Visit to Temple of Hatshepsut. •Photo - Stop at Colossi of Memnon.Any increase in the Airfare / Airline Taxes charged by the airlines on your air ticket(calculated at 1st July 2016 rates). Porterage, tips, insurance, laundry, wines, water, telephone charges, suggested excursions and all items of personal nature and also food and drinks not forming part of the group menus. Today, we take you on a guided city tour of Cairo. See the Pyramids of Khufu, Khafre and Menkaure. Also see the Sphinx, carved from the natural bedrock at the bottom of the causeway to Khafre’s pyramid. We then visit the Papyrus Institute and see beautiful paintings being made. Next, we visit the Egyptian Museum, which houses over 1,00,000 antiquities from every period of ancient Egyptian history. Do not miss the gallery featuring the famous treasures of Tutankhamun. We also visit the Royal Mummies Room, another highlight of the Egyptian Museum. Here you can see the mummies of many great Egyptian rulers, including Ramses II, the builder of the temples at Abu Simbel. Later, proceed to the medieval Bazaars of Khan-El-Khalili where you can shop for spices, precious stones and curios. Overnight at the hotel in Cairo. Today, we check-out of the hotel and drive to the airport for our flight to Aswan. On arrival in Aswan, we proceed to visit the High Dam of Aswan, the pride of Egypt and an ideal spot for a panoramic view of Aswan. This is where Egypt ends and Nubia begins. We then take you to see the Unfinished Obelisk. This Obelisk was never detached from the rock as it developed cracks in several places. Later, we board our legendary Nile Cruise for a great three day journey on the scenic Nile River. Overnight on board the Nile Cruise. Today, after collecting your box breakfast, we proceed to visit Abu Simbel by coach. Abu Simbel has two magnificent temples, temple of Ramesses II and the Temple of Nefertari. The Temples were threatened by submersion in the Lake Nasser, due to the construction of the High Dam. During the salvage operation which continued until 1968, the two temples were dismantled and raised over 60 meters up on the sandstone cliff where they had been built more than 3,000 years before. Then, we return to our cruise in Aswan for lunch, as our cruise starts sailing to Kom Ombo. On arrival, we visit the famous Temple of Kom Ombo. Overlooking the Nile, this unique temple is in fact the fusion of two temples, set side by side, with each side having its own gateways and chapels. The left side of the temple is dedicated to Haroeris, the falcon headed God. The right part of the temple is dedicated to Sobek, the crocodile headed God and God of Fertility. Overnight on board the Nile Cruise. 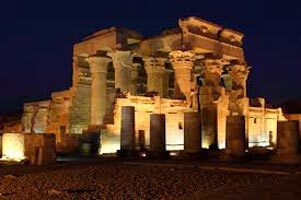 Today morning, on arrival into Edfu, we take you on a shore excursion to visit the Temple of Edfu. Of all the temples of ancient Egypt, the one at Edfu is not only the best preserved, but the second largest after Karnak. The temple had been totally submerged under the desert except for the very top of the pylon entrance. The temple is dedicated to Horus and was built in the Ptolemaic period. This temple is unusual in that it is on the west bank of the river which was normally dedicated to the afterlife. Next, enjoy the sights of the Nile River from the deck, as your Nile Cruise sails to Luxor via the Esna Lock. On arrival in Luxor, we visit the famous Temple of Luxor. There is magic in the tombs of the great Kings with their imposing architecture and marvelous paintings. Even after over 5,000 years, the paintings retain their original colors and tell the story of civilization gone by. Overnight on board the Nile Cruise. Today, we check-out from our cruise and visit the West Bank of Luxor. We proceed deep into the desert to discover the Valley of Kings. This is the place where generations of pharaohs and nobles were buried in great splendour, housed in crypts cut into the cliffs. On our return, we take a photo-stop at the Colossi of Memnon. These two giant statues are all that remain of the mortuary temple of Amenophis III. Next, our excursion takes as to explore Temple of Queen Hatshepsut, the only woman Pharaoh to have ruled Egypt. Later, check into your hotel in Luxor. Overnight at the hotel in Luxor. Any increase in the Airfare / Airline Taxes charged by the airlines on your air ticket(calculated at 1st July 2016 rates).